“Coming of Age in the Milky Way” is a book about the history of cosmology. It starts with the early worldviews of Ancient Greek philosophers and goes all the way up to modern theories of how the Universe began and evolved. The beginning I found good, somewhere in the end it started to drag along a little, but the end was good again. It finishes with accounts of how scientists were trying to find out the age of the Earth, the Sun and the Universe, and then also come up relativity and quantum mechanics and even string theory can be found on the pages of this book. For that matter it is a thorough account of it all and I’d really recommend it to someone who has not yet gotten acquainted with the development of the astronomical worldview. However if you’ve read some books on the same topic before you might not find much new or interesting as it was the case for me unfortunately. Otherwise the writing was clear, there’s no need for higher mathematics or much knowledge of physics or astronomy beforehand. 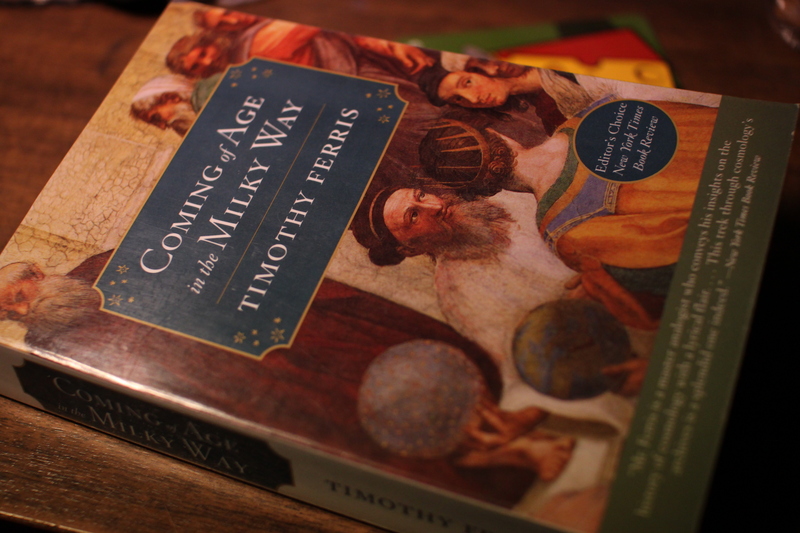 This entry was posted in Astronomy, History of Astronomy, history of science, Non-fiction and tagged book review, Coming of Age in the Milky Way, Timothy Ferris. Bookmark the permalink.